So every so often someone looks at my work and says, “Whoa, how did you do that?” Usually I shrug and say something like, “I don’t know,” or “It just came to me.” But I think I’ve decided that’s a lie. There are boat loads of articles and TED talks out there right now about failure and how it’s good for us. (Go ahead and google “art” and “failure” right now. How many million hits came up? I’ll save you some time and point you to this excellent list by 99U: “9 Reasons Why Failure is Not Fatal”.) And I have to say, I’m one of those people who thinks failure is not a bad thing. It’s a necessary thing. We think of large-scale failure (lose your job, close your business, fail a course) as this debilitating, humiliating event, but what if we didn’t? What happened to me last week is evidence of how utter failure can lead to a great success, a shift in your thinking, a new career direction–so I thought I’d share. It started with my procrastination. I’d agreed to be in a group show that focused on handmade paper. While I do make my own paper sometimes, it is not my forte. 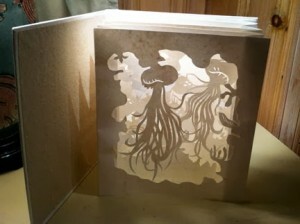 I don’t make amazing paper sculptures like some of my friends. I do not create breathtaking installation pieces. I make paper by hand because I like it, and I then I print books or broadsides with it. That’s it. I agreed to do this show because, frankly, what idiot says no to a 3-person show? I had several months to get my work together–plenty of notice–but I didn’t have work I deemed “good enough” to go in this show. I needed to make new work. But the thought of making some Big Impressive Piece out of handmade paper was crippling. What if it was a disaster? What if it was utter junk? What if it was the most hideous piece in the gallery? What if I was a laughing stock? So I spent six months thinking. And doubting. And reconsidering. I talked myself out of a dozen ideas. I choked. The deadline was February 21. In January, I came up with a plan: Make a series of tunnel books (made entirely of handmade paper) and pull a series of prints on handmade paper. They were fun, and a departure. Some were more successful than others. But that was exactly what I expected. I ended up with a few I liked, a few I thought were good enough for the show. Success. Excellent. That was supposed to be the hard part. The printing part was supposed to be easy–because I’m a printer. That’s solid logic, right? That’s why I did the books first, because the prints were the easy part of all this. I’d be able to slow down a little in the home stretch. That wasn’t even a little bit accurate. The prints were a disaster. I had a new press I was itching to use. A solid idea about patterns of images from nature. A stack of pristine white text-weight sheets of handmade paper. A collection of woodblocks that I could recycle into this series, layering images of birds and plants and bees–images that would perfectly illustrate my idea. They were some of the worst prints I’ve pulled in years. I should have taken process shots, but it felt like photographing wounds and bruises, and honestly I thought all of them were a lost cause. Move along, nothing to see here. I kept adding layers, thinking that some complexity might help–or at least disguise the mess. It didn’t. The above shot shows a few that were the least appalling. 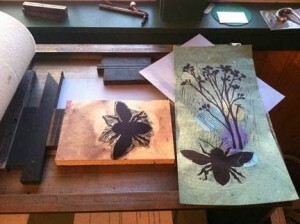 I was printing wood blocks and collagraphs, and the texture of the paper was fighting the texture of the woodgrain. It was a blurry mess, and the layers of birds and bees and ladies’ silhouettes couldn’t provide enough smoke and mirrors to fix that. I hung the ones that had at least some elements that I liked–but as rectangular pieces, they were failures. The excitement and intrigue I was hoping for was just not happening on the page. I couldn’t imagine them hanging on the gallery wall. I almost tossed them into the fire. It was February 14. After a long day of printing a stack of flops, I threw my hands up and decided to make more tunnel books–maybe more books would make up for the lack of wall pieces. It would have to do. I watched some Game of Thrones, drank some good bourbon, and just told myself that this was a failed experiment. Move on. 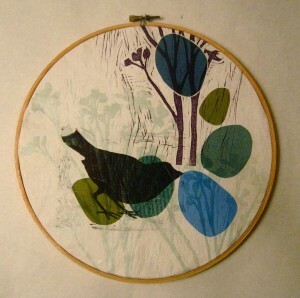 And then I remembered two embroidery hoops that I had bought in a junk shop months before. They were still lying in a chair by the TV. Who knows why I bought them. They were wooden and I thought they might be useful one day. And they were $1 each. Deal of the century. I liked it. This had possibilities. I imagined a whole wall of these…an installation. Then the pieces came together. I’d wanted to do something with repeating images–the same birds and bees and plants layering in different ways, interacting a little differently but speaking to this idea of the patterns that happen in nature and our memories. The familiarity of landscape has become important to me after living in the foreign Midwest for a while–when I was there and feeling like an alien, it was comforting to find certain flora and fauna that reminded me of home. It wasn’t until I thought of these prints in hoops that it struck me that this idea was the driving force behind this work. An installation was the best way to convey this idea–and a bunch of circular pieces, a little evocative of a view through a microscope, was perfect. So the next day, I went back to the junk shop and bought every hoop she had. I went back to the prints and added layers with a purpose in mind, knowing now that they would be cropped to highlight specific areas that were working well. 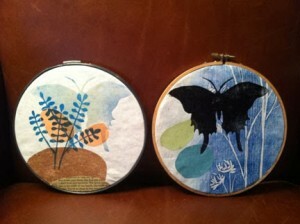 I added moths and birds to create focal points. I had a variety of sizes, a dozen hoops to work with. I was able to use the best parts of the prints, focus on the small silhouettes that I liked, and the less successful textures became background elements, layers that alluded to landscape and atmosphere. 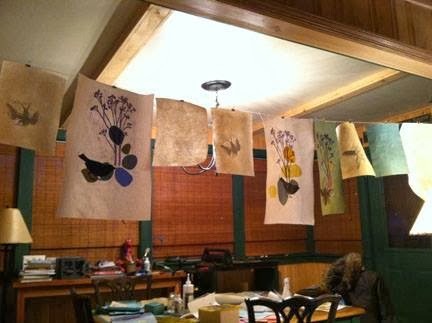 The idea was to hang them in the gallery in an organic shape. (I’ll post an updated pic when I get one from the gallery.) This would play the microscopic angle against a macro view that allows the patterns and similarities to be seen. Is this my best work to date? Probably not. But if I had stopped in the moment that I thought was utter failure, I never would have pushed these any farther. 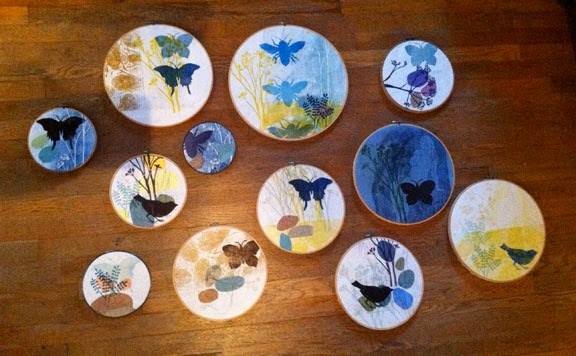 I never would have made them circular, or hung them in a group. I never would have pushed myself into doing an installation piece, and I would still be telling people, “I have no idea how to do what I do as an installation.” Failure was just a temporary state here, and I see now that really, that’s always the case. Granted, this is not a large-scale “failure” like writing a book that is panned or getting fired–but this small-scale failure made me think that, hey, all of those other bigger failures we deem disastrous might not be so bad for us after all. (And the bigger failures in my life that I’m beating myself up about and not sharing here–those aren’t worth beating myself up about at all.) Failure is just a moment of challenge, and a springboard into something you thought you couldn’t do. So embrace you failures, friends, because they are what lead you into new ways of thinking, brighter moments of creativity, and rejuvenated purpose. Sidebar: Did you ever hear the interview with Sara Blakely, inventor of Spanx? My favorite moment is when she says that when she was growing up, her father would ask, “What did you fail at this week?” It was a part of daily life, and nothing to fear–she calls it the key to her success. I think I’ll print that on my new press and hang it on the fridge. 1. Failure is just a launchpad. Make is a regular part of your life. Then it’s not a scary beast–it’s another routine, like your workout or your morning coffee. 2. Agree to do something outside your comfort zone now and then. You might surprise yourself with the results. 3. Procrastination isn’t always so terrible. Sometimes it forces you into a moment of insight. How do you feel about failure? Got a good story? Would love to see your thoughts in the comments! Oh, this is the story of my life! I could write a book of epic proportions! The first chapter would involve saying yes to the person who said, “I’m desperate for an exhibit for a visiting author coming next week.” Well. Just saying, desperation is a great motivator!